Version 3.6.1.0 is a new cloud version is available since January 15th 2018. This is a new application and does not replace the stand-alone version, currently 3.5.5.1 for both Windows PC and Apple Mac computers. A new version of ClockIn for Windows touch screen tablets is now available for trial. Two touch-screen compatible versions are available, one for use with a remote database and a stand-alone variant. If you would like to try this version, send an email to info@explorepyxis.com. This is a new version that runs from a remote database. The database can be on on internal network or on a remote cloud server, for example. The new Cloud Clock:In features enhanced security measures. These are included to help identify cases where one employee clocks-in or clocks-out another. The new Cloud version now includes an option to book multiple days-off at the same time. Previously, one day was booked at a time. When Cloud Clock:In is connected to a remote cloud based server all clocked-in employees are displayed in each client. Just seconds after the work-week finishes Pyxis ClockIn compiles the hours worked, public-holidays, personal holidays, etc., for each employee and emails the complete report to your payroll manager. In cases where employees are on service-calls or where employees forget to clock-out, Pyxis ClockIn can be set-up to automatically clock them out after a given period. This is then noted in the report so there is no confusion. Breaks can be applied after a given period, for any given length of time. For example, the application can apply a break of 30 minutes, after 4 hours have been worked. If necessary, the administrator can enter, edit and delete times and other data for all employees. The administrator can easily and quickly create and email reports for one or all employees independently of the automation process. The weekly report contains a summary of each employee and time worked followed by a detailed listing in a logical table format of all clock-in and clock-out times. All Pyxis applications are designed to be user friendly. Pyxis ClockIn is no exception. The interface contains only clear essential controls. The application sends a daily notification to the manager / owner if an employee requests a day-off.a. Each week the application emails a reminder notification of any upcoming employee days-off for the coming two weeks. 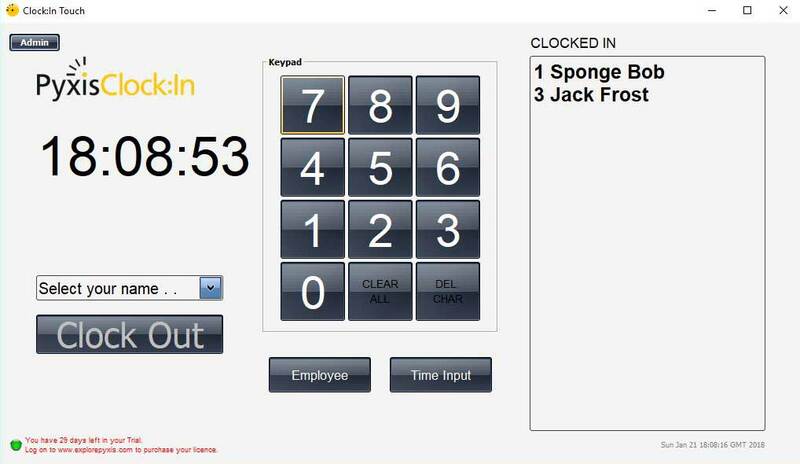 In practical terms, Pyxis ClockIn eliminates the full time job of tracking and compiling employee hours. The application does it all. And the employee enters their desired days-off through the application, which in turn will send a daily email to the owner manager, of any days-off requested by staff. Plus, Pyxis ClockIn sends a weekly email reminder, listing any day-off coming up over the coming two weeks. An employee simply enters their code and presses the Enter key. The mouse can also be used, but this is a little slower. Both global and employee specific default employee hours can be entered. These will be used in cases where an employee is clocked-out automatically. Buy your very own Pyxis Licence today!